Bike Lane Simplicity, originally uploaded by [Zakkaliciousness]. Simple aestheticism on the bike lanes of Copenhagen. 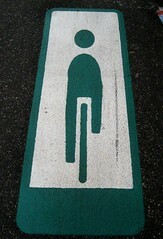 The cyclist featured enjoys an average speed, together with the other half a million daily cyclists, of 15,3 km/hour. In comparison, busses have an average of 14 km/hour and cars, 28 km/hour. While the stats for the automotive traffic are tied to congestion, the average cycling speed is largely based on how fast people bike. There are traffic jams for bikes in Copenhagen - on the busiest arteries over 20,000 bikes will pass each day - but increasing the average speed would mean that cyclists would just have to ride faster. The 'Green Wave' system coordinates the traffic lights to give cyclists a 'green wave' all the way along the route. Some people have bike speedometers - not many - but most can adjust their speed using their experience, without electronic interferance, and enjoy an uninterupted ride to and from work. Most of the stretches featuring the Green Wave have 15,000 - 30,000 bikes per day. 20 km/h is fast, yes. The City knows that most cyclists don't ride that fast but there are many who do so they should have a chance to sail into the city centre on a green wave.